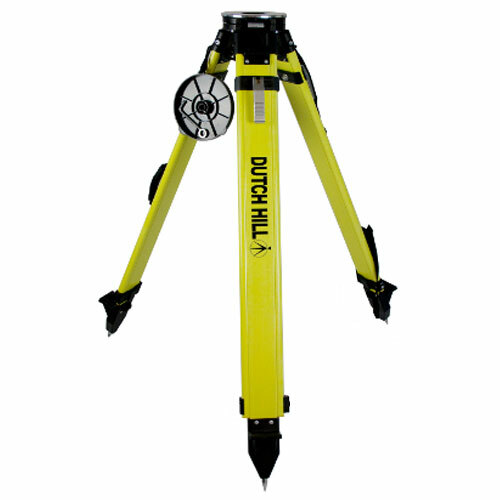 The Dutch Hill DH01-018 Heavy Duty Fiberglass Tripod will provide relieable support for your equipment. legs that extend the height from 46 to 72 inches. Dual clamp locks with thumb screws and lever for a positive lock and quicker setup. Features steel foot point with long spike that grip firmly on a wide range of surfaces. Flat round aluminum head with standard 5/8 X 11 threading. Aluminum clamping handle for long life. Hardware for leg restraint to prevent legs from splaying on concrete. Max work load: 60 lbs.